Well, dear readers, it has been a very long time. I’ve got a pretty good excuse though–it’s called Quilt National. 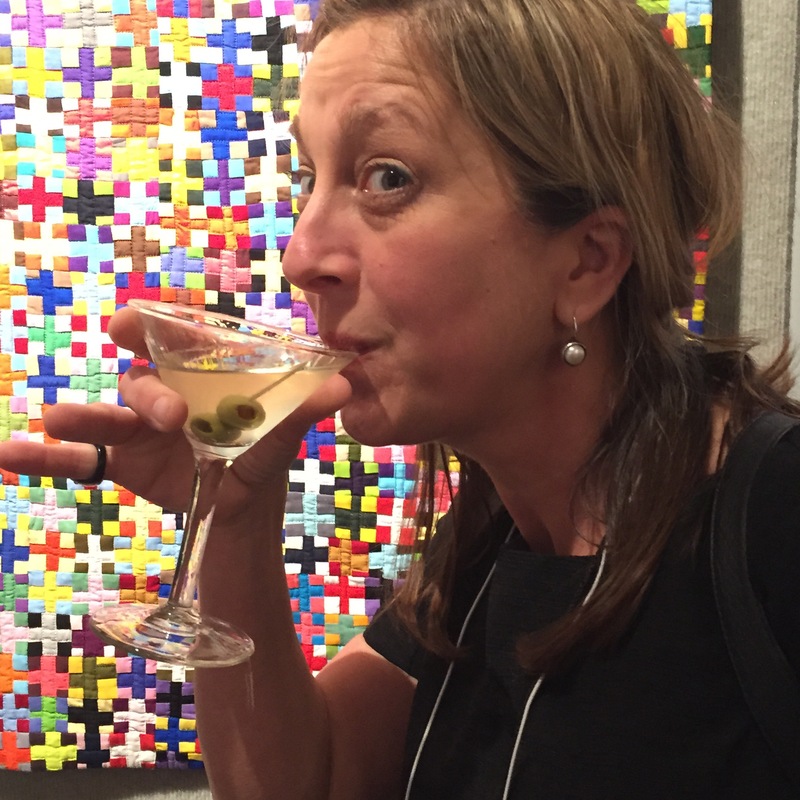 I think of Quilt National as THE BIENNIAL of the art quilt world. 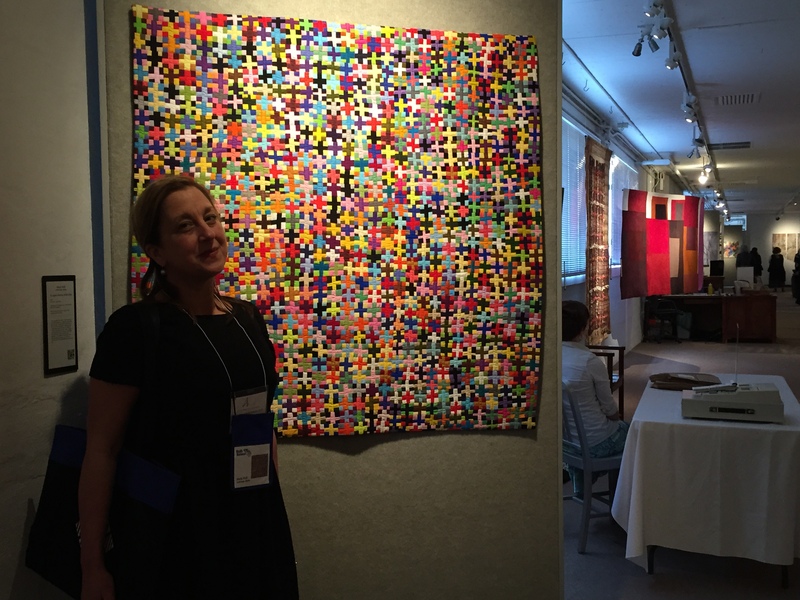 And while chances are I will never exhibit at the Whitney, I was invited to share my work at this year’s Quilt National. And really, who is to say that one is better than the other…. For those of you who do not know Quilt National, let me share a few details. Artists from around the world submit work for consideration by the jurors of this show. 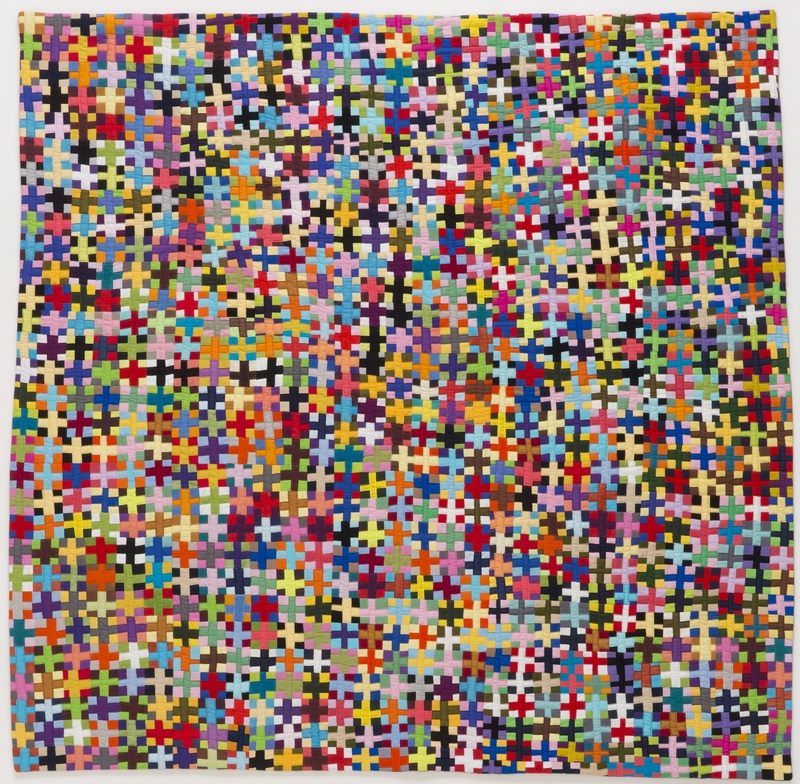 This year, 86 quilts were selected from nearly 1,000 submissions. Or to put it another way, it’s kind of like winning the lottery. Or better yet, making an Olympic team. More than 6,000 visitors are expected to attend this year’s exhibition. I’m been working as if my whole life was leading up to this moment–which, coincidently, it was. How to get from the southside of Anchorage, Alaska to a Dairy Barn in Athens, Ohio? Good question. 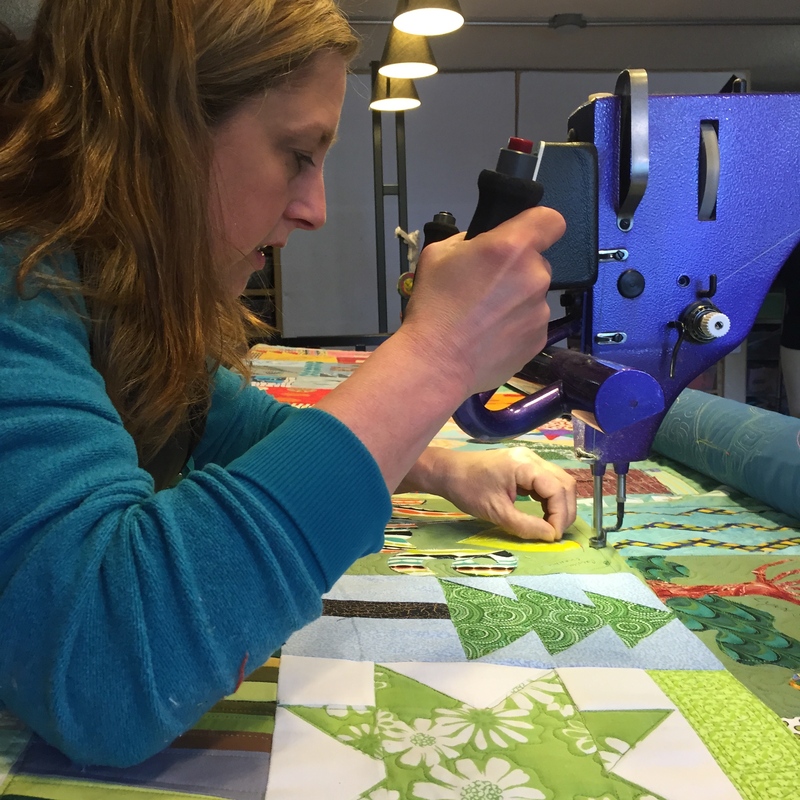 I had a major deadline that stood between me and the opening of Quilt National. Then I quilted some more. Until the clock said exactly 7:00 PM on Wednesday evening May 20, 2015. Walt took the quilt off the long arm and pack it into my suitcase, whileI ran upstairs and changed my clothes. We were off to the airport. 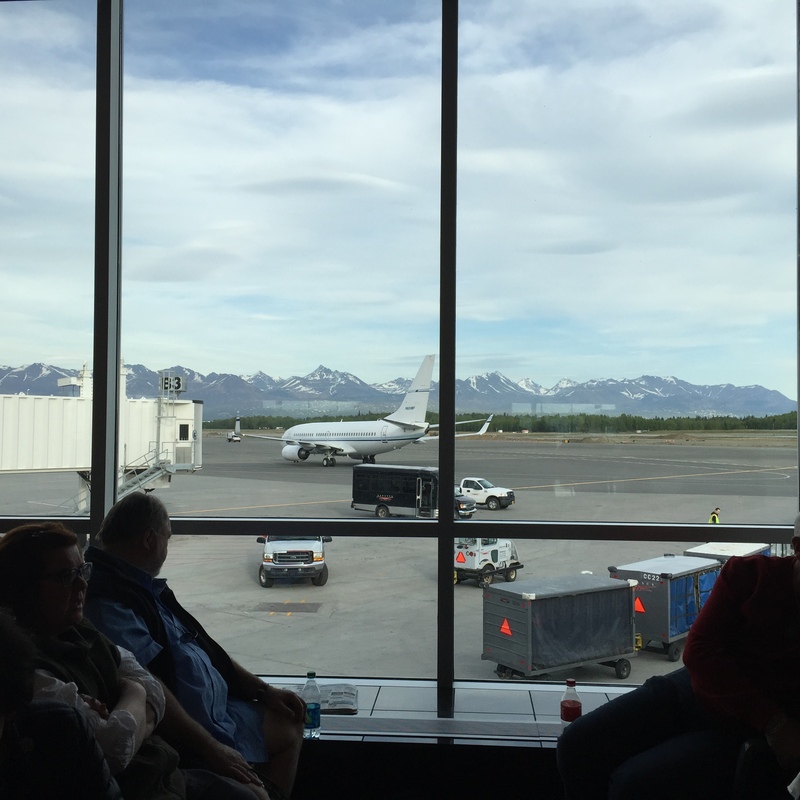 From there, I sat in a series of airports for almost 24 hours including a very long stint in the Port Columbus, Ohio airport. 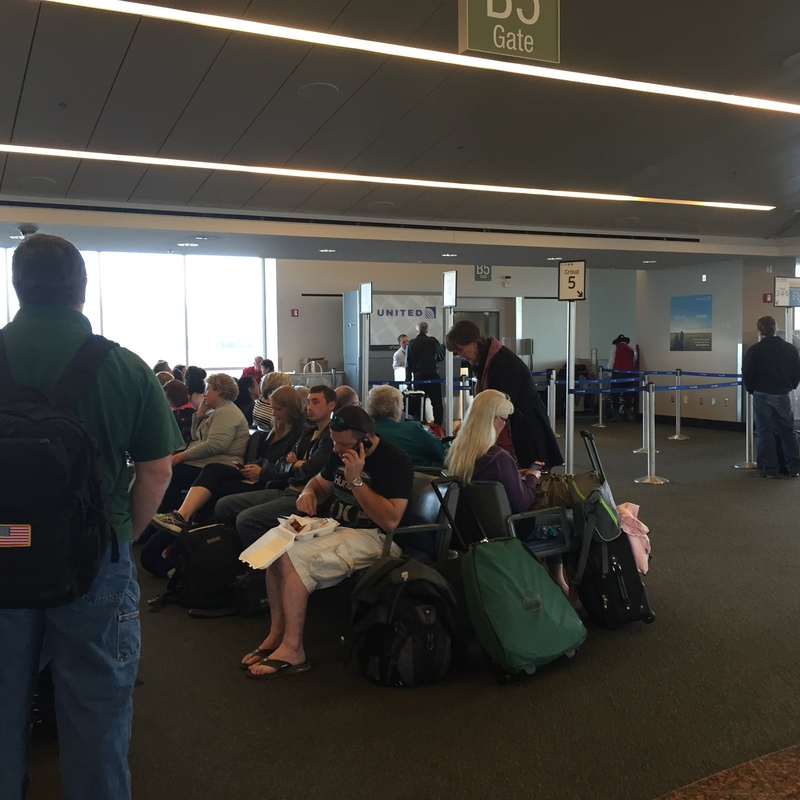 Delays, miscommunication, stupidity on my part all resulted in hours of airport waiting. Things were going poorly for me. All I could think about was that I had a quilt that needed finishing, and instead I was sitting jet lagged and miserable in the rent-a-car section of the airport du jour. There is only one person to blame for this situation, but we aren’t going to go there right now. We’re in celebration mode–not whoa is me mode. Not, when am I ever going to learn the essentials of time management mode. 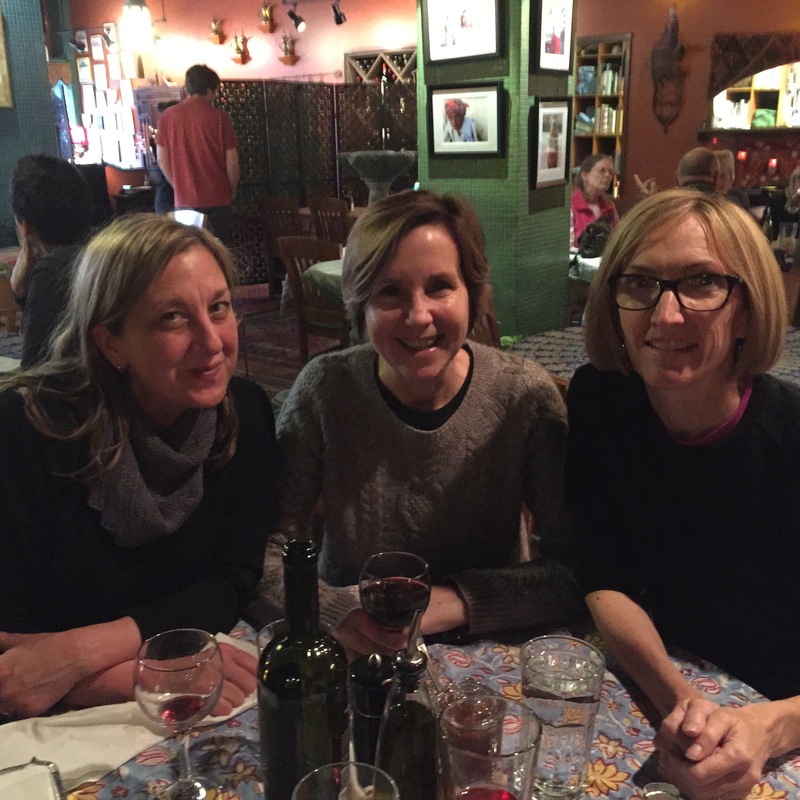 Eventually, I hopped in a car with Carol Trice and Kathleen Probst and we headed towards Athens, Ohio. We had a yummy dinner. And then I slept for as long as I could. 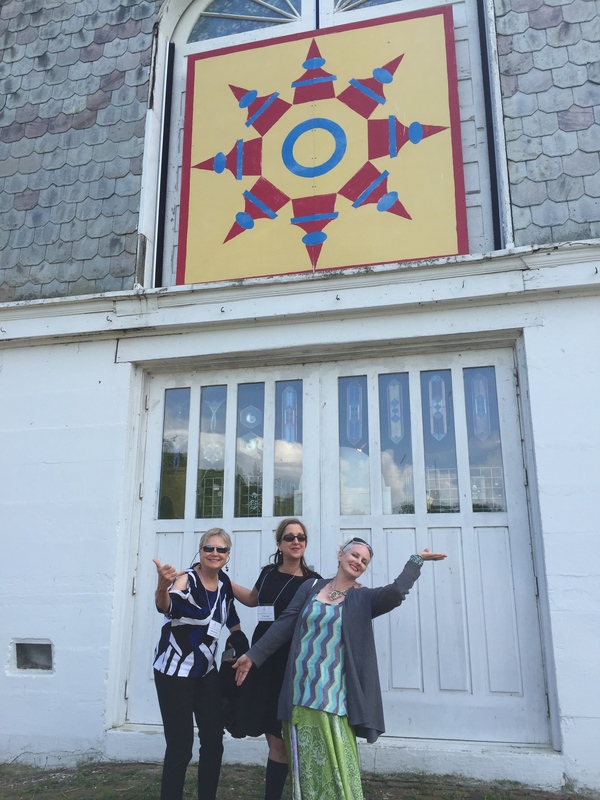 The next evening we went to the Dairy Barn–the birth place of Quilt National. For many of the Quilt National artists, our worlds of stitch and thread, piece and patch were on this balmy May day in 2015 joined together for the first time. 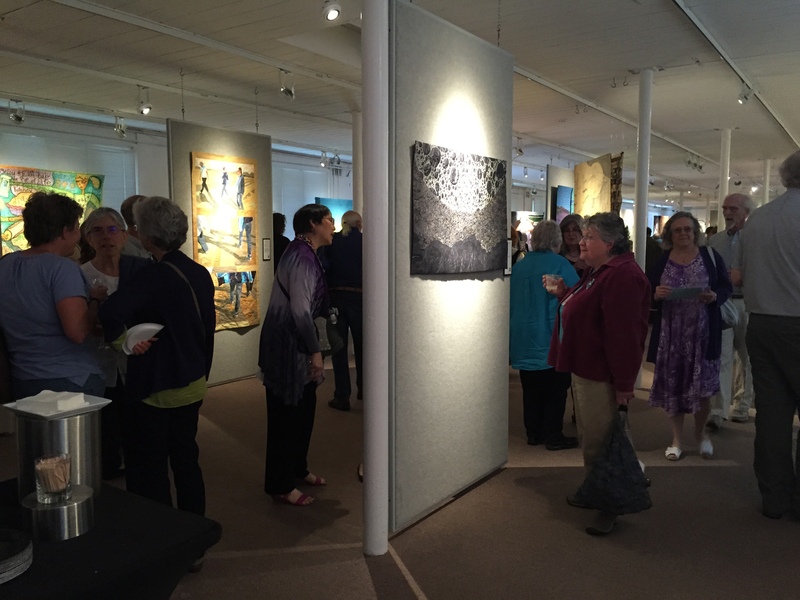 The opening was crowded–hordes of quilt lovers. I thought the show was amazing, and I will tell you more about that later. But first, I’m going to put the flash light over my head and claim the spotlight for just a wee moment. This is my quilt To Agnes Martin, with Color. The back side is pretty good too. I kind of really love this. Is it better than the front? Hmmmm. Cheers to all of the artists whose work is celebrated in this year’s exhibition. I am honored to be in your company. This is the artist statement you will find next to my quilt. 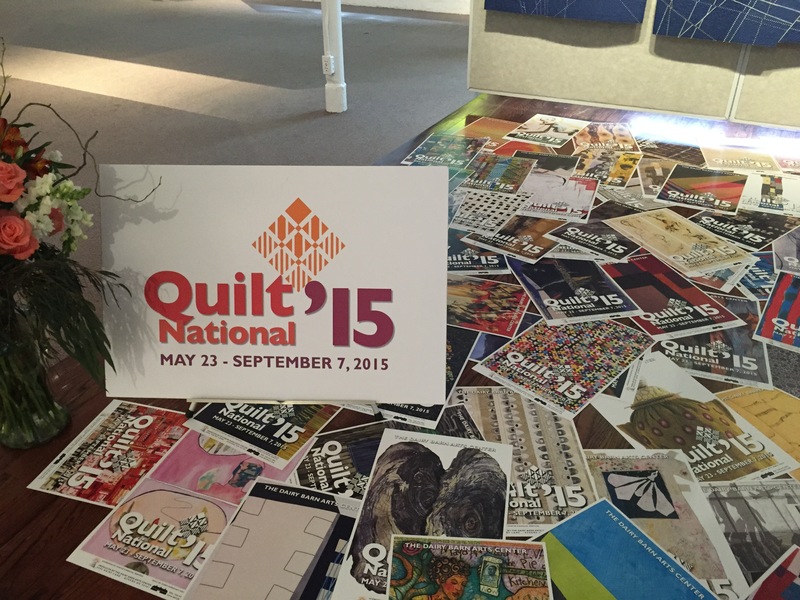 Gratitude to all of you who make Quilt National a reality. PS- Thank you Alaska State Council on the Arts and the National Endowment for the Arts for helping me travel to this important event! 28 May	This entry was published on May 28, 2015 at 9:05 AM. It’s filed under Art in Place, News And Events and tagged Quilt National, The Dairy Barn, To Agnes Martin, with Color. Bookmark the permalink. Follow any comments here with the RSS feed for this post. 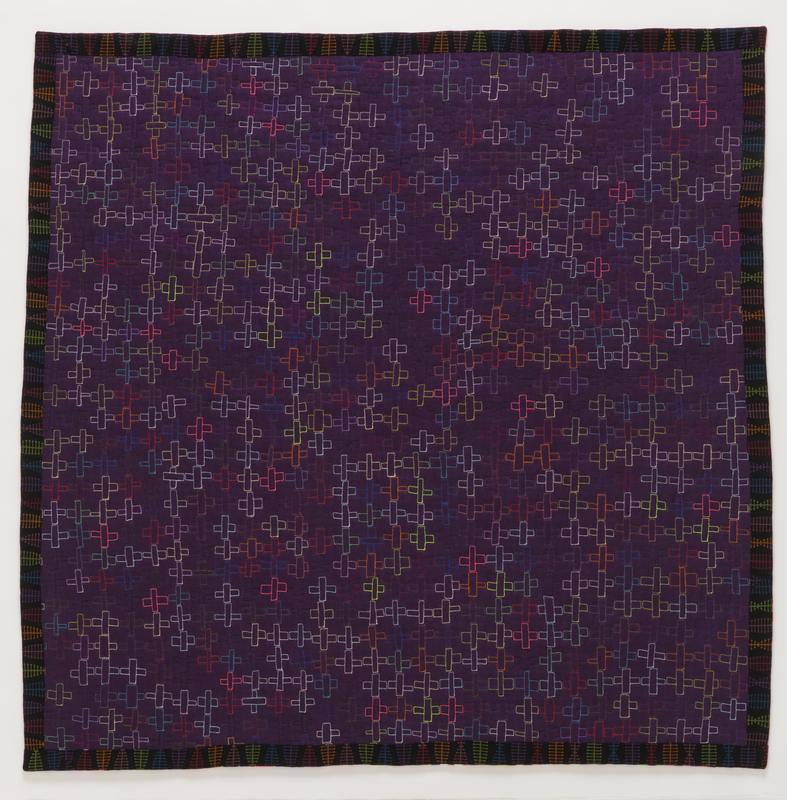 Your quilt is wonderful; congratulations on being at Quilt National! Beautiful! How much time did you spend on this piece moving the blocks around to get a composition you liked? How much is it random versus planned? It works so well and is wonderful to look at, but I find it hard to determine how you achieved that with all these somewhat scrappy little blocks. You are definitely a skilled and talented artist–thus the Quilt National honor! Congrats! Heidi- thank you! I am going to write a blog post about the process of making this quilt, but basically I pair the blocks with other blocks that I think complement each other. I do this at the sewing machine, over and over again until the units get bigger and bigger. I then take the units to the design wall and start arranging them into bigger units until it feels harmonious. It is an intuitive process. I love your exhibition photos on Facebook! Thank you, Maria! Looking forward to seeing what you are up to next…! 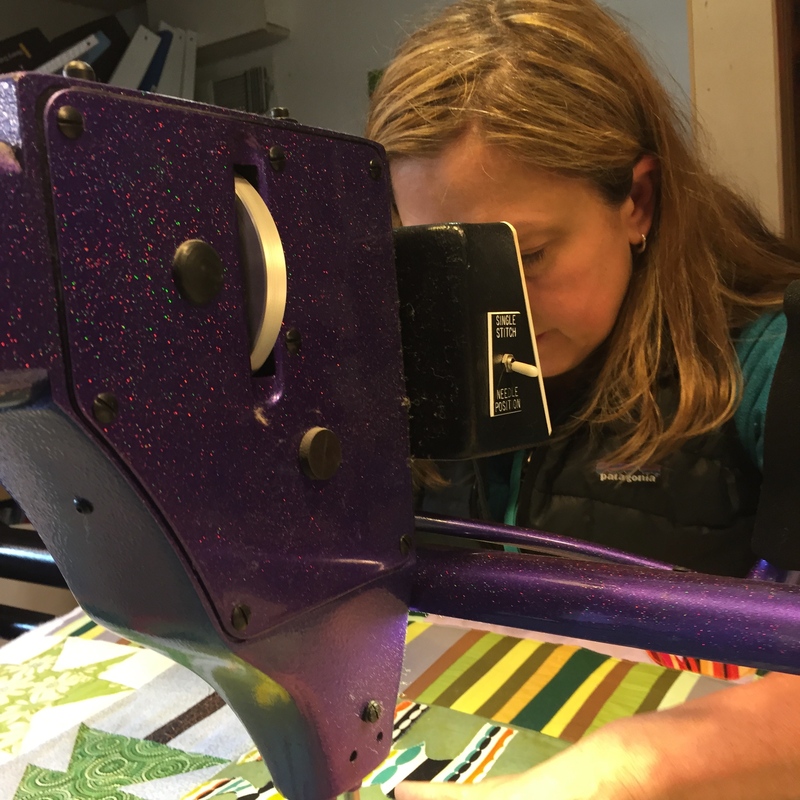 Hooray for the indefatigable Alaskan Quiltmaker! Some day I’ll be brave enough to apply to Quilt National. You encourage me with your example. I’m sure I’m not the only one, so next year there will probably be even more entries. Thank you Pam. I know you’ve got a Quilt National quilt in you. I’m sure of that. Happy for you and your great “national” experience! An incredible piece of work. Congratulations! Thank you Lorie! I LOVE that our quilts live next to each other. Congratulations. Wonderful quilt and (eventually) fun trip. I love all your “bits” in this piece. I love the saturation of the colors and the rhythms in your works. Brava! Congratulations on being in Quilt National…a very well deserved honor! Thank you Lynn. I enjoyed the photos of your show that Heidi posted on Facebook. I love your quirky exhibition! Agnes Martin would be so proud! But instead, we will all have to be proud for her. Well done Maria! Teresa- What would Agnes Martin say? I do hope she would be proud. Thank you! Well, dear friend from Anchorage… its about time those 900 pieces made it into the quilt you always thought they cold be! Stunning, THE COLOUR… Wow!, but not more than YOU – Maker, Dreamer and ARTIST! So many congratulations. I had chills when I got to the photo…. wish I could have been there! Safe home, eh! Bethany- you are always so nice to me! Thank you. It was a great adventure. 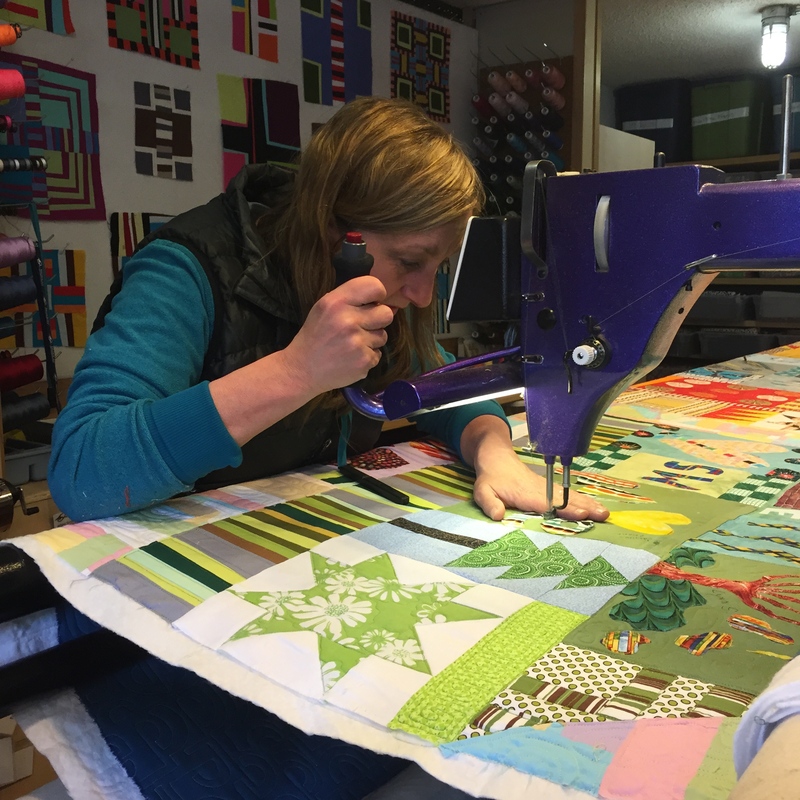 Congratulations on being selected for Quilt National. I love all the “bits”, a lovely riot of colour and the quilt back is equally as lovely, well done. Congratulations on having your wonderful quilt in Quilt National! Very well deserved! Congratulations! QN is my aspiration one day. Awesome work. Thank you Madmslottie! I hope you apply. It’s about the journey. Maria, it was great to see you and your quilt at QN. Your hard work and perseverence have all paid off! I hope you are enjoying the ride. And it was great to see you too! Sue Walen and I are planning a Obama quilters reunion at the SAQA Philly conference. I hope you will join us!